THIS CLASS IS FULL. NO WALK-INS PLEASE. 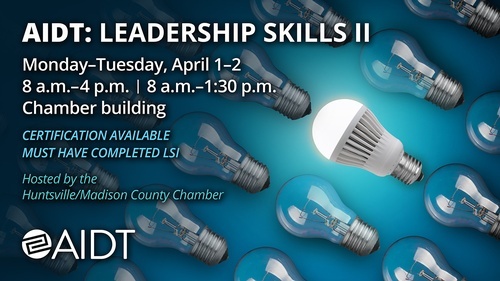 Leadership Skills II (LSII) is a follow-up course to Leadership Skills I and includes more advanced topics of supervision. There is a comprehensive test given after the class, and if passed, offers the credential of ?AIDT Certified Leader II?. *Must have completed Leadership Skills I. Limited to 25 participants. 8 a.m–4 p.m.; 8 a.m.–1:30 p.m.
*This is a 1.5-day course. *Limited to two indivduals per company.